Home » Health » What Is Aortic Dissection? Aortic dissection is a disorder in which the inner lining of the aortic wall is torn and separated from the middle layer of the aortic wall. The aorta is the largest artery in the body whose role is to receive oxygen-laden blood from the heart and drain it throughout the body through the branches of the arteries. As a result of tears in the inner layer of the aorta wall, blood can leak and flow through the tear, then make the inner layer separate from the outer layer, thus forming a fake blood channel in the aortic wall. This condition can be fatal if the tear causes tearing of the entire aortic wall (aortic rupture) or closes the normal blood flow in the aorta. More aortic dissection is experienced by elderly men (aged) around the age of 60-70 years. Most people with aortic dissection have a history of high blood pressure or hypertension . However, the causes of aortic dissection can be related to several other health conditions. If aortic dissection can be detected early, it rarely causes fatal complications. But unfortunately, the diagnosis of this disease is often late because the symptoms of aortic dissection are not typical. Chest and upper back pain . The pain suddenly appeared, was very intense, and felt like there was something sharp and pierced in the chest. Sudden abdominal pain if there is a blockage in the mesenteric artery that drains blood to the intestine. The pain radiates from the neck to the lower back. Leg pain, difficulty walking, and paralysis of the legs. A weak pulse in one arm or thigh compared to the other. Aortic dissection can occur in the part of the aorta close to the heart ( ascending aorta ) which is often classified as dissection of type A aorta, or in the part of the aorta that will branch into the chest or abdomen ( descending aorta ) which is often referred to as type B. Aortic type dissection A is more dangerous than type B. High blood pressure or hypertension is the most common cause of damage to the aortic wall. High blood pressure can suppress aortic tissue, making it more prone to tearing. Chest injury, for example due to a car accident or falling. Congenital abnormalities of the heart and blood vessels, such as narrowing of the aorta, patent ductus arteriosus , and abnormalities in the aortic valve. Atherosclerosis or hardening of the arteries. Smoking or using cocaine can cause the heart and blood vessel systems to become abnormal. Pregnancy. Aortic dissection can occur in healthy women during pregnancy, although this condition is rarely encountered. It is not easy to detect aortic dissection because this disease shows symptoms similar to a number of other health problems. The diagnosis starts with examining the patient, especially checking the patient's heart rate. If there is an abnormal heartbeat or a difference in blood pressure between the left and right arms, the doctor can suspect aortic dissection in the patient. Chest X-ray In most sufferers of aortic dissection, aortic dilation is found, but this result can also be caused by other disorders. CT scan with contrast agent. With this examination, the condition of the heart, aorta, and other blood vessel problems can be seen more clearly. Transesophageal echocardiography ( transesophegeal echocardiogram ). This scan shows a picture of the heart. A device with high-power sound waves is inserted into the esophagus, so that it can produce a clearer picture of the heart than ordinary echocardiography through the chest wall. Magnetic resonance angiogram (MRA). This tool uses magnetic fields and radio wave energy to produce images of blood vessels. Aortic dissection can cause death several hours after the attack. Therefore, this disease is classified as an emergency medical condition that requires immediate treatment at the hospital. Intensive care is needed to carefully observe the patient's vital signs, such as pulse, blood pressure, and respiratory rate. For cases of type A aortic dissection, patients will be given medication through the intravenous channel. Giving this drug aims to reduce heart rate and blood pressure so that it can limit the spread of dissection, but can still maintain adequate blood supply to the brain, heart and kidneys. Examples of these drugs are beta blockers ( beta blockers ). After administration of the drug, doctors usually recommend surgery if the location of dissection is very close to the aorta and heart. The operation is intended to lift the aortic layer in the area of ​​dissection, closing the canal that forms when a tear in the aortic wall occurs, and reshapes the aortic wall with synthetic material. If the aortic valve is leaking, surgery is also performed to repair or replace the valve. With fast handling, patients can avoid life-threatening aortic rupture. As for type B aortic dissection with a location farther from the heart, the doctor will also provide medication such as type A patients. Furthermore, the cardiologist can consider the operation of stenting in a blood vessel using the catheterization technique, which is to insert a tube through large thigh artery (femoral) until it reaches the location of the dissection, then insert the tube through the hose attached. The installation of this stent aims to reshape the aortic blood flow which can drain blood normally. Stenting is also needed if there is a leak of blood from the arteries, which clogs the blood supply to the legs or other vital organs. Patients with type B aortic dissection without complications can usually recover by long-term administration of drugs accompanied by routine examinations. After treatment, all sufferers of aortic dissection must continue to take medications to keep blood pressure low for life and reduce pressure on the aorta. The drugs in question include anthypertensive drugs such as beta inhibitors or calcium antagonists , and cholesterol-lowering drugs. In addition, lifestyle adjustments also need to be done, such as running a diet with balanced nutrition, exercising, not smoking, and maintaining an ideal body weight. Stroke when a blockage occurs in the cerebral arteries that supply blood to the brain. Heart attack in the event of blood clots in the coronary arteries that supply blood to the heart muscle. Spinal cord damage that causes the legs cannot be moved, if the spinal arteries or spinal cord are blocked. Kidney failure can occur if a blockage occurs in the renal artery that supplies blood to the kidneys. 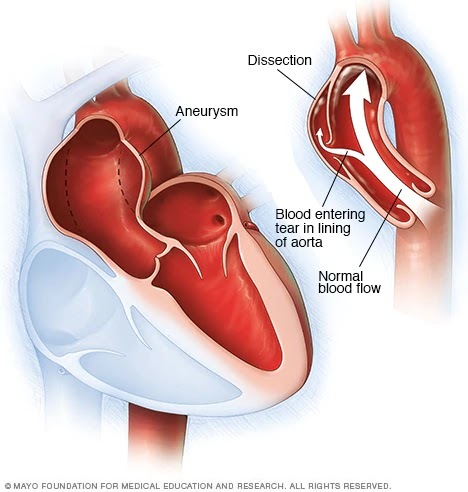 In addition to blockages, aortic dissection can cause rupture of the aortic arteries (rupture), resulting in bleeding that can lead to death. 0 Response to "What Is Aortic Dissection?"